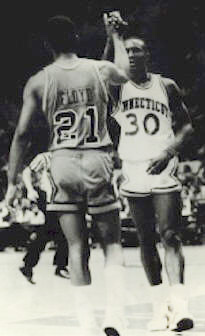 Norman Bailey was a Guard for the UConn Huskies from 1980 – 1983. In October, 2004, I had the opportunity to talk to Norman as he reflected on his childhood as an athlete, his time at UConn, and his basketball experiences in Europe. Norman became interested in basketball when he was 8-10 years old. He has five brothers and seven sisters. Norman’s brothers all played high school sports, and he tagged along with them because they were his babysitters. He learned a lot watching from the sidelines, and began getting involved playing in the neighborhood, and with the Christian Youth Organization basketball teams. Norman grew up in the Blue Hills neighborhood of Hartford, CT, and played for St. Justin’s CYO team. As the years passed, Norman played against a lot of the same kids from the CYO teams as his high school team, and his college team. He also spent much of his time playing at Kenney Park in Hartford, and that is where he honed his skills with and against many other street, high school, college and NBA legends. The transition going from high school to college wasn’t easy but Norman felt like he fit in well. Everyone needs to realize that everyone was a High School All American, an All Stater, an All Conference to make the transition a little easier. Norman left UConn-Storrs and tried taking classes at the West Hartford UConn Branch, but was unsuccessful, became depressed, tried working but was also unsuccessful. He began spending some time with a former alumni of Northwest Catholic, Jack Phelan, who was the head basketball coach at the University of Hartford. Jack knew a coach overseas looking for some players so Norman was soon on his way to Europe where he landed his first pro contract in Northern Ireland, and during the next six years he played in Ireland, Portugal and Spain. While playing in Europe, Norman’s teams won a championship in Ireland, and two championships in Portugal. “I’m very competitive and we had some successful teams.” During this part of his career, Norman averaged 30-35 points per game, and had a lot of 40-point games. After six years, Norman decided it was time to come back to the United States. He missed his family. He began working with “at risk” youth in the Hartford, CT juvenile detention center as a detention officer for seven years. He also spent some time working as a transportation officer for three years in Bridgeport and Hartford. Norman became a supervisor for Community Solutions, and ultimately ended up at CT Job Corp. For the past four years he has been a shift supervisor for multiple departments managing the day-to-day operations in the New Haven office. 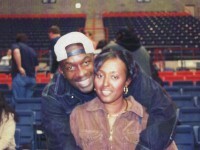 Norman is currently engaged to Mary Odum of New Haven. They will be married in August and they reside in Hamden, CT. He has a daughter, Taniesha, 20 years old attending Savannah State University studying Business Administration. Three years ago his daughter Kristen Rose, passed away at age 10, as she had Down Syndrome and contracted pneumonia. Norman still follows UConn basketball, attended 10-15 of their games this past year, and said it’s a pleasure to watch them.